When Austin Animal Center received 29 roosters from a cockfighting bust, we knew we wanted to save them. 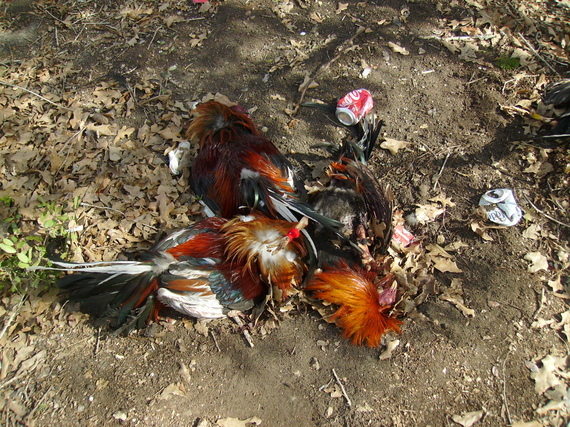 Cockfighting, while illegal in all 50 states, is still fairly common in many places. 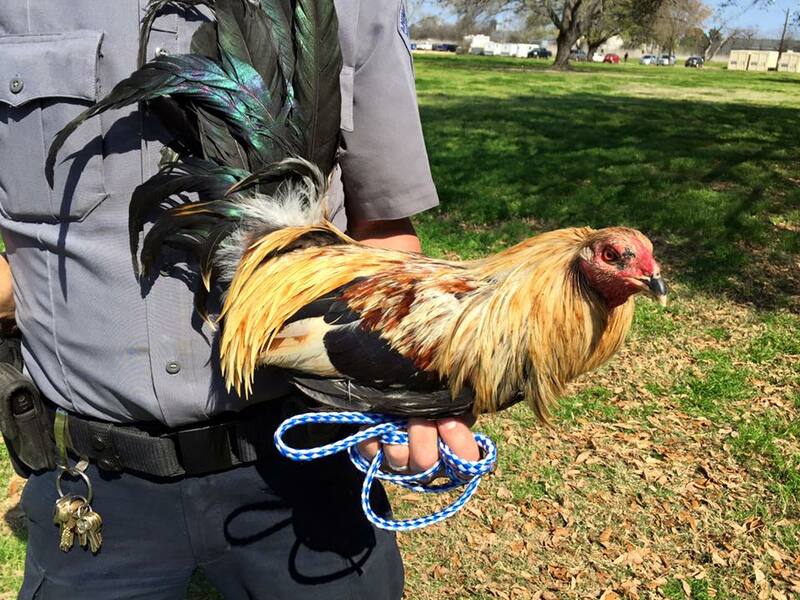 Our roosters were seized when our local Sheriff's office entered the property during an active rooster fight. Many of the birds were injured, several so badly they had to be euthanized. In addition, there were dead birds strewn around the scene of the crime. Cockfighting is ugly business. 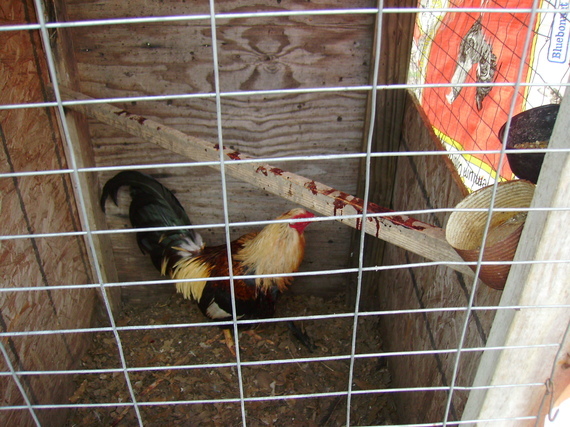 In addition to having their wattles and combs cut off, the roosters' spurs (the sharp claws on the insides of their legs) are removed and for the fight, sharp knives are tied to their legs where the spurs used to be. That's why the roosters often actually kill each other during a fight. 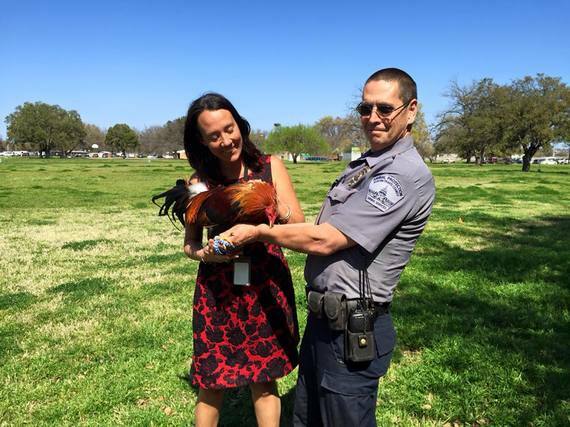 When the Center received the roosters, staff didn't know what to expect. Over the past several weeks, we got to know them very well and on March 8, all 26 of these former fighting roosters were adopted into loving families and are looking forward to spending the rest of their lives as pets. Along the way, we had a lot of people cheering us on but we also heard a lot of people telling us why there was no way we could possibly save these birds. We're happy to say, those people were wrong. On behalf of these roosters we'd like to share a few of the common myths we heard and what our experience showed us in hopes of helping other communities who might one day have their own fighting roosters and be faced with a choice: To euthanize or slaughter them as was the common practice in the past or to try something different and treat them just like the other animals who need our help, protection and advocacy. 1. "No one will want a rooster. There just aren't adopters out there for them." Our roosters became available for adoption on Tuesday, March 8 at 11 a.m. and by 5 p.m. every single one was adopted. We had a line of people at the door and several potential adopters who were upset when they weren't able to get one because they were all adopted. 2. "They're aggressive towards other animals." Their spurs, which are the only thing that makes them capable of causing real harm, were removed when the birds were used for fighting. Without those, these roosters are more likely to get hurt by, rather than hurt another rooster. And while it's true roosters will likely try to fight with other roosters or even chickens, they're fighting "from fear of death, not from natural aggression" Following the rehabilitation protocol from our friends at Vine Sanctuary, roosters can successfully be rehabilitated over time and can even sometime live among other roosters. All of our adopters received several resources on rooster rehab before bringing their new bird home. 3. "They don't lay eggs so no one will want them." 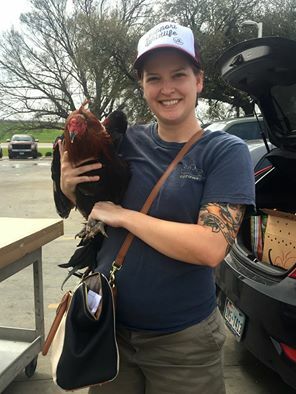 One of our adopters plans to do clicker training with her rooster. Others plan to keep theirs as family pets, on farms and in the city. 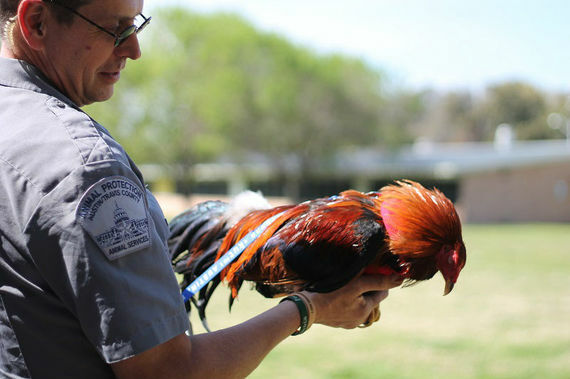 One of our adopters had a long history of rescuing fighting roosters when he lived in Mexico. 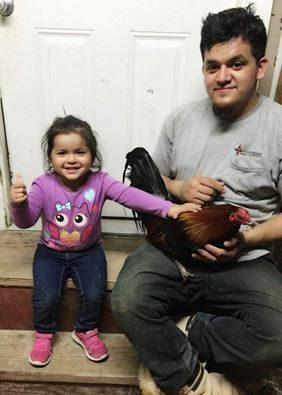 He was so excited to be able to help save an Austin rooster! 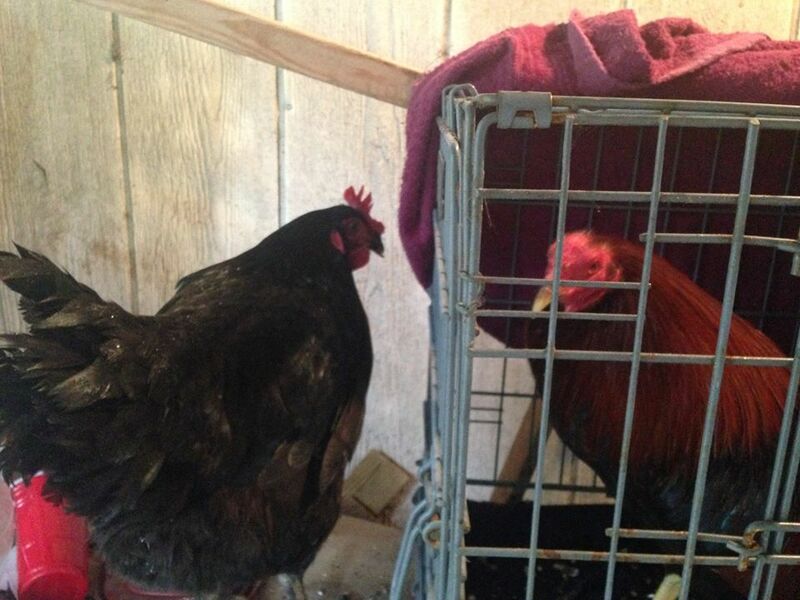 None of our adopters wanted our roosters for meat or eggs - they just wanted them as pets! 4. "They're aggressive towards people." This is just not true, at least not with these roosters. For us, they were as easy to handle as a chicken just a little bigger and stronger. The number of shelter visitors, reporters, staff and volunteers who petted, held or cuddled a rooster last week was probably in the hundreds. Don't believe it? 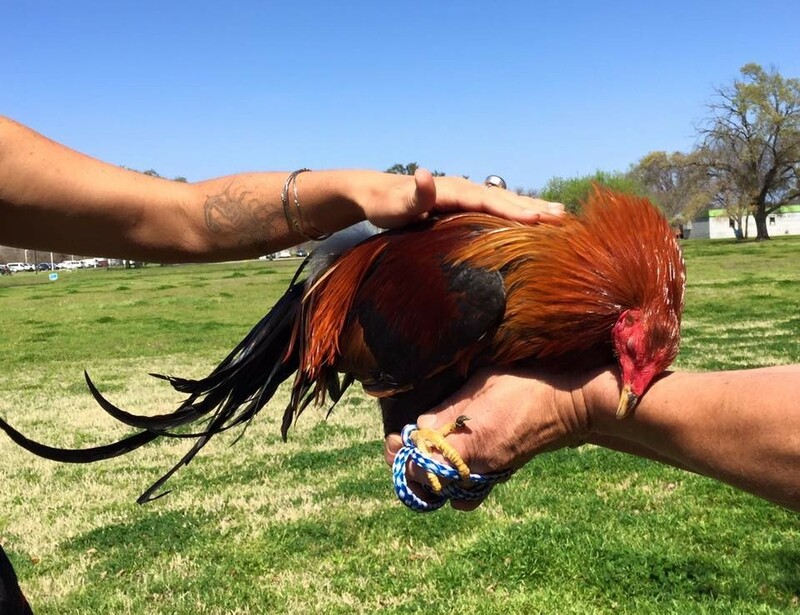 Check out this story from the Dodo and see copious amounts of rooster cuddling. 5. "People will want them for fighting." The morning after the roosters were adopted, our inbox was full of photos, stories and thank you notes from the rooster adopters. We were touched to see the roosters in their new homes, surrounded by people who will love them and treat them as pets. Just to make sure the roosters would be safe, we microchipped each one and let their adopter know we'd be following up. 6. "They're impossible to rehabilitate." 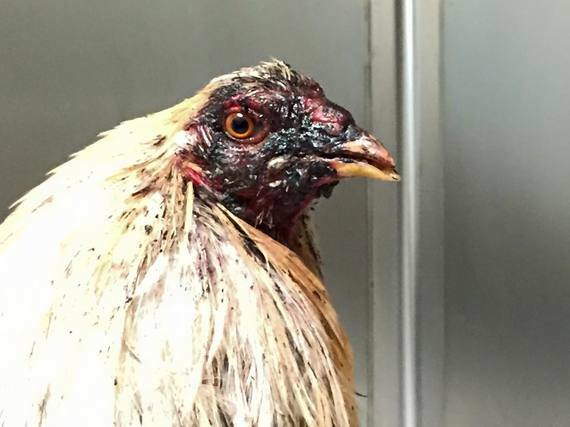 Just ask the folks at Vine Sanctuary and others who rehab roosters all the time. It's just not true. The Friends of the Austin Animal Center supplied all our adopters big, roomy crates and perches to give the roosters plenty of time to acclimate during the rehab process. This is one of the roosters meeting his new chicken friend. She chooses to stay right beside him all the time. 7. "They crow too much." There's this thing called an anti-crowing collar. It's humane and it works so roosters can even be kept in more densely populated areas. 8. "They don't want to be near people." You just need to watch the videos of the birds walking on harnesses and the photos of them enjoying neck scratches to know that's not true. Our roosters kept falling asleep in our arms whenever we would take them outside to feel the sun on their backs. 9. "They've been pumped up with steroids." Steroids are also used on racehorses too and while we have no evidence the birds in our care were ever given steroids, these drugs will eventually leave their system. In any case, it doesn't seem like a good reason to euthanize them. 10. "They've been bred for fighting." Luckily, cases like the Vick dogs have put this argument to rest. Lots of animals have arguably been bred for aggression and have been forced to fight and time and time again, those animals have shown us they can be saved and go on to have lives as loving, family companions. Here's what we learned after spending three weeks with 26 fighting roosters: Roosters are just like every other creature. They want to live. They want to get along. They don't want to be harmed. They're trusting even when they have no reason to think humans are anything but terrifying and they're even affectionate. Roosters are smart and can learn tricks on how to walk on a harness and they even can learn to come when they're called! People keep roosters as pets and one woman we met even has a baby pool just for her pet rooster where he can go swimming every day. People keep roosters indoors and out and just like dogs, there are lots of opinions on rooster care, feeding and enrichment. They're just like every other animal we help and they deserve to live!